The first several hours I spent in SFMOMA’s Garry Winogrand retrospective, I thought writing about it would be easy: it seemed like each of the 300 images offered such imaginative fodder that the only problem would be to avoid long-windedness. 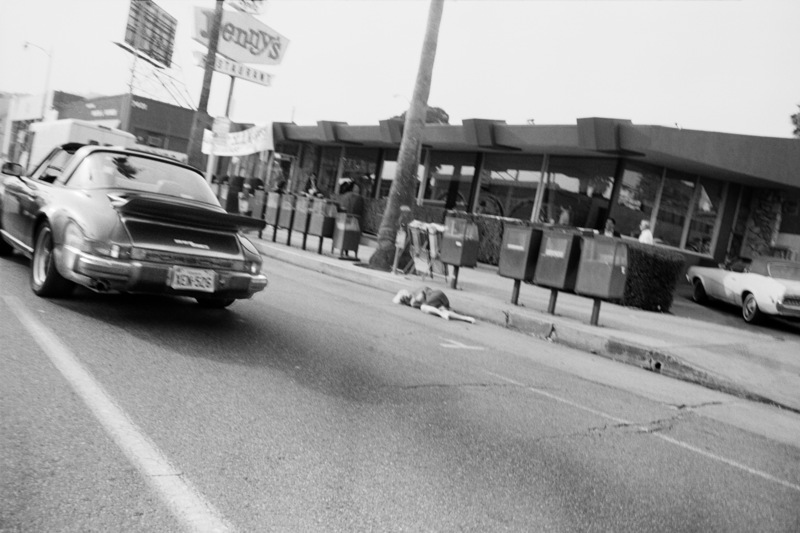 But eventually I realized that that approach would be pointless, for the very reason that Winogrand’s work, while never simple or obvious, isn’t exactly opaque, either. They’re not the sort of images that one blinks at for a while before concluding that art is incomprehensible and wandering off in a state of alienation. The confluence of aesthetic and dramatic elements in each image is incredibly engaging — however one interprets them. What is the black man thinking as he stares into the eyes of the dehorned rhino in “Bronx Zoo, New York,” made in the turbulent year of 1963? What is the rhino thinking, for that matter? What is the tuxedoed man shouting as he drives his slick car in 1959’s “New York”? Or is he singing along with the radio? Is there someone just out of sight in the passenger seat that he’s shouting at or is he just taking advantage of a moment to himself in his car to enjoy a good scream? Is it reading too much into the image of the suited man of late middle-age from 1960, to think that the angle at which his solid frame is set against that of the tall buildings around him, and the gesture of pulling his spectacles case out of his inside breast pocket (or replacing it? ), together with the grimace on his face, combine to look nearly like the posture of a man clutching at his chest at the start of a heart attack? And that the seeming grimness of his solitary experience is amplified by the comparatively jolly, oblivious men chatting behind him? 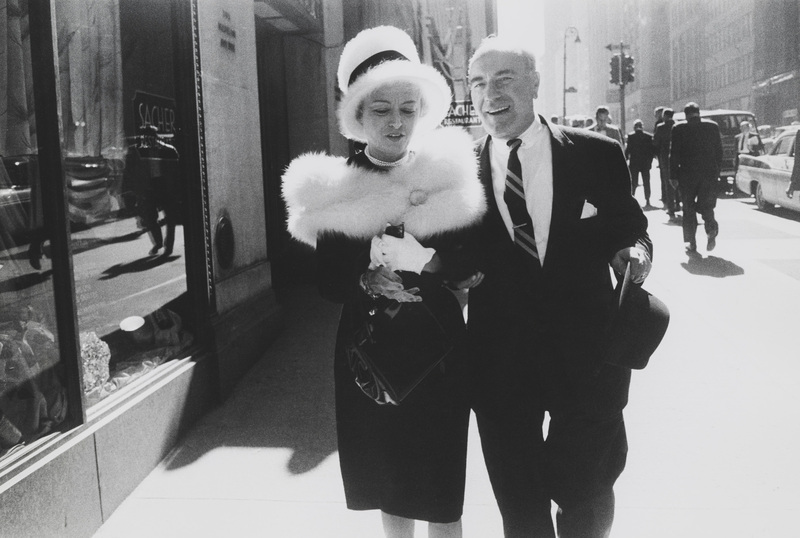 Part of what’s delightful about the collection is deciphering these elements as if they were clues to a hidden storyline, and then marveling at the fact that there is no storyline; that these are just rich, spontaneous momentary scenes that Winogrand managed to recognize and capture in the moment of convergence. Taken together, one could posit that they create a storyline of sorts of the American middle-century. To that end, the exhibition is divided into three parts: “Down from the Bronx” concentrates on photographs he took in New York between 1950 and 1971, “A Student of America,” on photographs from the same decades taken during trips outside New York, and “Boom and Bust,” also outside New York, from 1971 to his death in 1984. 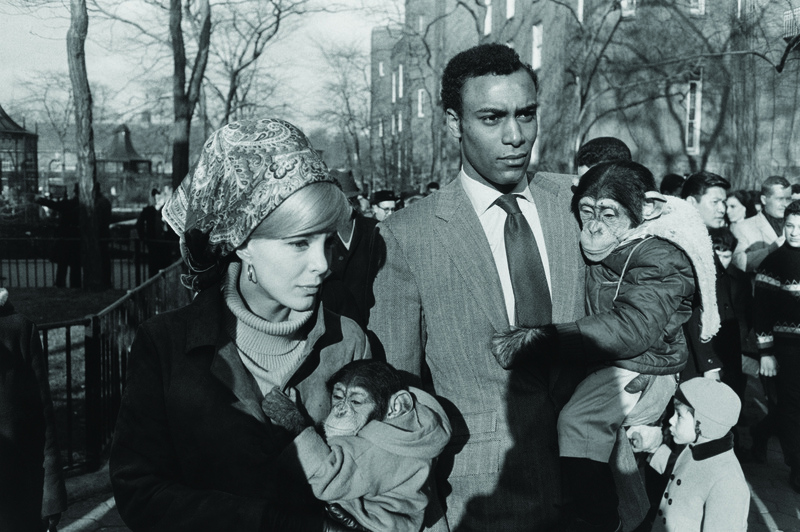 The common line on Winogrand’s canon is that the darkening of his vision over the decades reflected the country’s growing disenchantment in the post-Nixon years. This is not quite persuasive as an explication of Winogrand’s practice, nor of his vast, mercurial subject. One might, for instance, object to the presumption that everyone should share the same view of America, that there was, in fact, this downward turn of mood starting in the ’70s. Well, yes, maybe for some people, but if you were black, or a feminist, or homosexual, or pro-choice, or anti-HUAC, you might have felt the opposite, and that it was rather the entrenched and legislated bigotries of the ’50’s that had been disenchanting. This interpretation also disregards the presence of more troubling material in the New York years. But such examples, though rare, are stunning. In one image from 1960, a woman makes her way through the cold and driven snow down what looks to be one of the wide, brownstone-lined streets of Harlem. She is black and she appears to be poor: rather than a shawl, she’s wrapped around her head a neckscarf, which isn’t wide enough to cover the back of her head or neck, or even long enough to tie under her chin, so she’s fastened it with a safety pin. For an era when a certain fastidiousness with one’s toilette was customary, regardless of a person’s means, she seems strangely unkempt. Her scarf is sloppily hung, and her coat is missing a button. These bits of negligence echo a dejection in her face. She seems tired, sad, and is one of the few women Winogrand photographs at such proximity who does not even look up at him (notable because this was also an era before the ubiquity — and compactness — of cameras; surely she would have noticed the tall ginger with his lens trained on her?). The opposite is also true for the later work. Who could fail to detect some humor in such images as 1975’s “Fort Worth,” in which a boy’s smooth round face and tiny eyes weirdly resemble that of the sheep standing next to him? Or in the likeness of smiles on the faces of the elephants drinking from their waterbucket in 1974’s “Austin”? Is the tipsy ebullience of the three ladies in (another) “Fort Worth” from 1974-77 any less authentic than that of the slightly more polished but still frisky couple at the Metropolitan Opera in 1951? This entry was posted in ART, photography, REVIEWS, San Francisco and tagged ART, Garry Winogrand, photography, REVIEWS, San Francisco, San Francisco Museum of Modern Art, SFMOMA, street photography. Bookmark the permalink.